Please donate to our 2019 National Tour Fundraiser to enable AUOB to continue with our amazing demonstrations across Scotland next year. Having successfully completed our 2018 national campaign for an Independent Scotland, we at AUOB would like to thank all that came out and marched to show Scotland’s appetite is growing to become free. We would never have been able to have such success if our supporters from all walks of life never came out for the demonstrations and who importantly donated to make sure that we had the money in place to fund our 2018 National campaign which saw in excess of 220,000 Independence supporters on the march for Scotland freedom across the marion.- a magnificent statement which made our movement visible and the end of the 'Union’ a foregone conclusion. 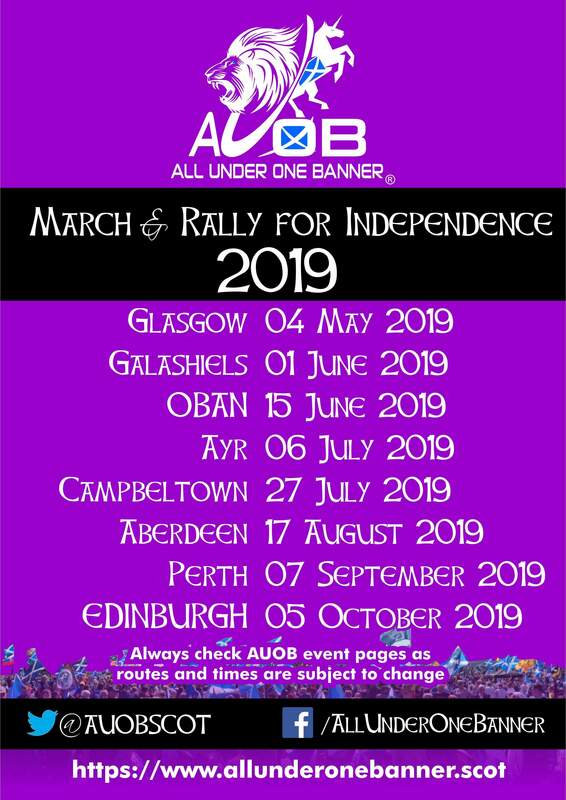 We at AUOB know we have to become even stronger to drive home the message of an Independent Scotland, so in 2019 we are going to locations with communities who have contacted us seeking AUOB to March & Rally where they are. So here we ask you all to help us make this possible and so have launched our new crowdfunding for our 2019 campaign as we push to see take the AUOB national tour to other locations across the Nation. We are seeking to raise a minimum target of £20.000 so that each of our 2019 demonstrations has at least £2500 to spend- allowing the hiring of stage, sound and generator equipment, Large Screen TV Hire and Toilets- whilst also ensuring that we have funds in place so that flyers can be produced in sizeable quantities to give each March & Rally the promotion necessary to make them as massive and powerful as possible. In time we may start another crowdfunder campaign if successful with raising the basic amounts for these events, as we hope to launch a national billboard campaign as still many people in Scotland never knew that any of 2018’s AUOB demos were taking place, so we have to try and reach them all.